Here’s one reason the modern biking boom is great for everyone: more bicycle trips mean fewer car trips, which can mean less congestion for people in cars and buses. But there’s a catch. A recent study shows that when bicycle use rises but cities don’t add bike lanes to put the new bikers in, traffic congestion actually gets worse. In some situations, it gets a lot worse. It’s happened to most regular bike users; it happened to me last week. Biking to meet friends at a restaurant, I had to pedal two blocks uphill on a street without bike lanes. As I started to push up the slope, a man zoomed his car around me, straddling the two lanes and laying on his horn as if I’d done something wrong. I’d love to be out of your way too, I wanted to tell him. But this parking lane would have to go. I had every legal right to use the traffic lane. But a 2013 study from the University of Virginia’s civil engineering school shows that in a sense, the man wasn’t wrong. I was indeed slowing the whole system down. Modeled streets had one travel lane in each direction and a bus line that could get stuck behind a bike. Source: Gosse and Clarens. A) One where bicycles were 1 percent of traffic (about the level of many U.S. cities) with no bike lanes. B) One where bicycles were 1 percent of traffic with bike lanes. C) One where bicycles were 10 percent of traffic (about the level of Eugene, Oregon, or Boulder, Colorado) with no bike lanes. D) One where bicycles were 10 percent of traffic with bike lanes. The street with the most congestion? It wasn’t Street A, which represents so many in the United States today. The most congested street was Street C.
Even after Gosse and Clarens assumed that cars, trucks and buses would have a chance to pass a bike every 100 meters or so, the increased biking only slowed everyone down. Jonathan Lewis, deputy director of transportation in Atlanta, said he’s noticed this in action. The problem seems intractable. Even if a city succeeds in boosting bike use, it faces a backlash once the new riders start slowing traffic. Fortunately, the study by Gosse and Clarens also suggested a way out. To be sure, congestion isn’t always bad. On many streets, a little travel delay can be great for both local businesses and driver safety. Every successful downtown in the world is full of slow-moving vehicles; it’s a sign of success. Also, the UVA findings don’t mean that people shouldn’t be allowed to bike in travel lanes on popular roads. Restricting public streets to people who own cars would be both unjust and impossible to enforce. But the study does mean something important to the politics of bike infrastructure. 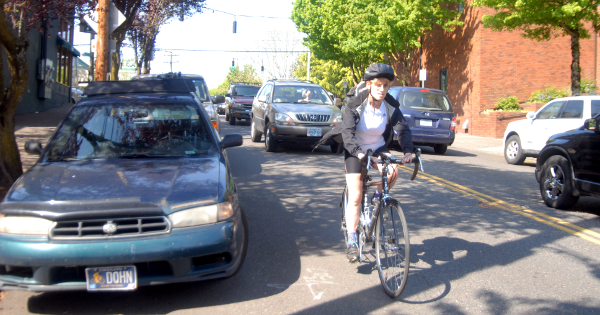 If a city doesn’t build bike lanes, then “bikes vs. cars” is actually real. But if a city builds bike lanes, more biking becomes a win-win. Public support for bike infrastructure and programming depends on one crucial concept: that more biking benefits people whether or not they ever ride a bike themselves. 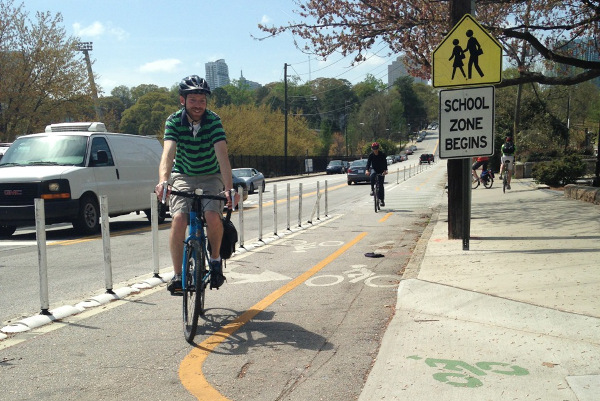 Lewis, the Atlanta transportation deputy director, said that’s one big reason it’s important to add bike lanes to busy streets when possible. But for a city to keep its bike lane network growing, where will the road space come from? On streets with more than one lane in each direction, the best answer is often a road redesign that also adds a center turn lane or removes passing lanes. But for two-lane streets, the UVA study offers another useful answer: curbside parking spaces. Because the Gosse-Clarens model calculates the anti-congestion benefits of a bike lane to the transportation system, it offers a way for cities to calculate how much money a curbside parking space needs to be worth in order to justify its existence. Lewis said that’s exactly what Atlanta has concluded, too. It’s now working on several projects that will replace parallel parking with bike lanes.